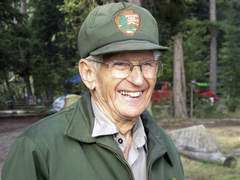 Lyle Ruterbories, oldest National Park Ranger at 93. – North Fork District Ranger Scott Emmerich talking about Lyle Ruterbories, the National Park Service’s oldest ranger at age 93. Mr. Ruterbories and his wife, Marge, managed the Kintla Lake Campground in Glacier National Park, Mont. since 1991, and Ruterbories has continued on his own since her death in 2005.